50+ World > History & Headlines > 1945 > Were You Alive in December 1945? Patton was a military man for his entire life and had seen action as a young man in a calvary unit during the Mexican Revolution and again in World War I.By the time WWII ended, General George S. Patton had become the stuff of legend in the U.S. military, referred to as "Old Blood and Guts". Actor George C. Scott's portrayal of Patton in the 1970 film of the same name, was popular with baby boomer audiences. Scott apparently captures the essence of General Patton, although Patton's actual voice was not as deep and raspy as Scott's - below, Scott emulating Patton's famous delivery of a speech to the Third Army during WWII (strong language warning). 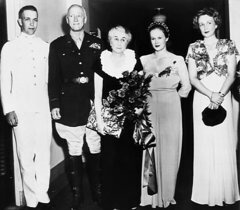 Seniors and baby boomers may not be aware that George S. Patton was also an athlete. He placed 5th in the 1912 Olympic Game Pentathalon, competing in the pistol range, swimming, fencing, equestrian, and footrace events. The 1945 movie The Bells of St Mary's opened in December starring Bing Crosby and Ingrid Bergman. This popular movie was one of Bing Crosby's first Christmas movies. Bing Crosby received his 2nd Academy Award nomination for Best Actor, for his role in The Bells of St. Mary's. 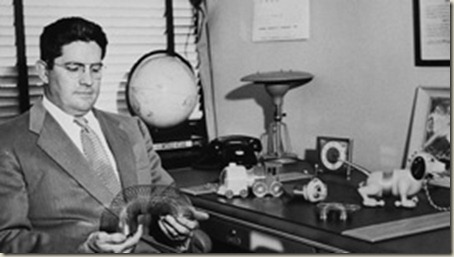 The Slinky toy invented by naval engineer Richard James (below photo: pdxretro.com) in the early 1940's, was demonstrated at Gimbels department store in Philadelphia for the first time in November 1945. The entire stock (400) of the Slinky toys sold out in less than 2 hours, making it one of the most popular new children's toys that Christmas. The Slinky has proven to be a favourite toy with baby boomers, their children and grandchildren.